Find the right wetsuit for Swimrun! Most SwimRun races require that you wear a wetsuit as part of the compulsory kit – as you’ll be swimming in cold, often choppy and exposed water it’s for your safety more than anything. In my experience you’d soon be carried off with hypothermia without one anyway! If you’re already into outdoor swimming, chances are you’ve already got a swimming (triathlon) wetsuit. There are loads of makes and models out on the market now, all boasting different features, materials and levels of buoyancy. Finding the right one for you can take some time and it’s a completely individual and a personal choice. When it comes to SwimRun wetsuits until recently there was very little choice. It was only in 2014 that Head brought out the first SwimRun specific suit and this year has seen the launch of new SwimRun dedicated wetsuits from companies such as Orca, Zone3, HUUB and Seal. These new suits offer a host of different features designed to make wearing them during SwimRun much easier and more comfortable – after all, until now wetsuits were never designed to be worn during 50km runs! I’ve already got a swimming wetsuit, do I need a SwimRun specific wetsuit? 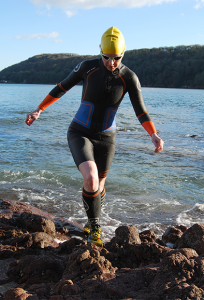 If you are new to SwimRun there is no reason why you can’t give it a go in the wetsuit you already own. A regular full swimming wetsuit will certainly do a perfectly good job for you in the swimming stages, it will just take a bit more getting used to when you find yourself out running on dry land. During a SwimRun race you are likely to be wearing a mesh bib over the top so suits that have the zip at the back can be tricky to undo when you start to get hot and want to take the top half off. You may also find that for buoyancy there is thick neoprene over the legs and knees which can get pretty hot and hard going – it can feel a bit like running in a sauna with resistance bands tied around your ankles! Until recently the answer to this problem was to take a pair of scissors to a standard wetsuit cutting just above the knees and the elbows to make a surf style shortie, thus allowing better freedom of movement when running, but with good quality wetsuits now costing upwards of £300, it’s a committed move! If you don’t have the coffers for a new SwimRun wetsuit but you’ve got a cheap or old suit that will need replacing soon then go for it! If not then I’d suggest looking for a cheap or secondhand suit that you can modify to suit your needs (you can often pick up some highly reduced ex-demo suits direct from manufacturers too). If you suffer from cold, then maybe try just cutting the legs off first and see if you can get away with keeping the arms long while running. This will stop so much flushing of cold water through the suit as well as insulating your arms. The back zip will still be an issue but so long as you practice you will get used to it. Another option is to ask a custom wetsuit company, such as Snugg or No Limit Wetsuits, to add one in for you. Ok, so I fancy getting a SwimRun suit, what should I look for? Zippers: SwimRun wetsuits always feature a front zipper, sometimes a back zipper as well. The zips tend to be longer than usual in length to aid the removal of the top half when running. Having a front zip is much simpler to manage when running and allows ventilation when you want to cool yourself during the long runs and chest space for easier breathing. It also allows quick access to internal pockets (see below). Back zippers are sometime reversed – this means they do up from top to bottom which in theory offers a lot less water entry and better neck comfort and also means the zip cannot be pulled down accidentally (or on purpose!) by another competitor. They are a bit trickier to do up though – not good when you are running! Built-in pockets: SwimRun wetsuits feature accessible inner pockets for carrying things like snacks, compass, first aid kit, spare goggles. Some have external pockets on the back as well, similar in principal to a cycling jersey. Different thicknesses of neoprene: Thicknesses of neoprene on SwimRun wetsuits can vary between 1.5mm to 8mm! A much greater range than normal swimming suits. The reason for the differences to benefit buoyancy and freedom of movement. For example 1.5mm placed around the arms and shoulders gives extra flexibility, 2mm around the hips will allow for free movement when running, 4-5mm on the body will give upper body buoyancy, while 6-8mm on the front of upper legs gives extra buoyancy and an optimal swim position when swimming with shoes on. Toughened fabric: Nylon panels are sometime placed between the legs to reduce the frictional damage that could occur when running with the suit on. This is also sometime placed on the seat area to protect when sitting on rough surface or sliding down rocks. Glued seams: Seams maybe be glued, without over stitching, to help prevent chaffing. Rubber Seals: Short arm and leg designs often feature a rubberised leak-proof sleeve and leg cuffs to prevent them from rising up and too much flushing of cold water. Waist attachment loops: These allow you attach extra equipment to your waist and give you somewhere to attach a tow line if you are using one. Prepared for cutting: Full SwimRun wetsuits often have silicone or rubber tapes inside the arms and legs where you can cut them off you decide you want to customise it into a shortie – a rather scary step when you’ve forked out so much money for it! Built in whistle: Whistles are a compulsory piece of kit on SwimRun races so having on built into the suit is a bonus, as well as a great safety feature! Bright colours: Some suits are now featuring bright coloured neoprene, instead of the traditional black. Not only does this give much better visibility in and out of the water but also helps to stop extra heat being absorbed by the sun – A good thing! Trust me, your bottom will roast in the rays! Silicone coated arm cuffs: If you decide to stick with long arms internal silicone coating can be a great feature, allowing much easier on and off. Additional neoprene calf sleeves: Some suits come with a set of think (5-8mm) neoprene calfs sleeves which offer extra buoyancy, making up for the material lost when the legs are shortened. The need for these depends on your natural body position when swimming and how much your shoes weight you down. Get the shoes right and they’ll be so buoyant themselves you won’t need them! Fit for wetsuits of any kind is a very individual thing. A perfect one-size-fits-all will never exist. We are all built differently – some have smaller waists, broader shoulders, longer legs, shorter arms, longer torso etc but still fit in to the same general size category. So, with something like a wetsuit which is essentially a second skin, finding that perfect fit can be really hard. Wetsuit fit is a whole extra feature in it’s own right but the crucial thing about a SwimRun wetsuit is this: You have to be able to move in it easily – you should be able to freely rotate your shoulders and arms (i.e. the front crawl movement) with little or no resistance. You need to be able to run in it without excessive resistance against your stride. Any extra work you have to put in fighting the neoprene whilst swimming or running will cause you extra fatigue which you really don’t need! You may find that have to put up with a slightly looser fit that causes some flushing of water and will cool you down, but this can be helped by the choice of clothing you wear underneath your suit. For example, a sleeveless rash vest or trisuit will offer bulk and insulation without restricting the arms. Where can I get a SwimRun Wetsuit? Over the last couple of years a lot of wetsuit companies have embraced swimrun as a sport and there are now a lot of different swimrun wetsuits on the market! Zone3, Orca, Head, Huub, Ark, BlueSeventy, Colting, Dare2Tri, Mako, Nu, Sailfish and Zerod all have at least one model of Swimrun wetsuit on offer – most of them have a few models! Check out the reviews on the World of SwimRun website for their comments on them to help you decide. As with all wetsuits, choice really comes down to what features you want in a wetsuit and how the suit fits you. Don’t worry about it, just have fun! At the end of the day, what ever type of wetsuit you wear for SwimRun, it’s really just about getting out there and giving it a go! We know you’ll love it!